In a recent Friday's Collector Series, Maureen Taylor introduced Shades readers to her very interesting collection of wedding photographs. I do not collect wedding photographs, but after looking at the article I wondered what I did have in the way of weddings. I have a collection category I deem "Weird, Strange, and Unusual." The name is an apt description of what can be found in this category. In looking through those photographs I found four photographs that were taken of weddings. I have chosen one of those wedding photographs as the Photo Of The Week. This photograph is classified as unusual, as I have not seen many wedding photographs that picture the bride and groom as well as a child. (1) The card measures 4 1/4 in. (h) by 6 1/2 in. (w) and is 0.03 in. thick. The image measures 3 15/16 in. (w) X 5 1/2 in. (w). The sides of the card are scalloped, the corners of the card are square, all with gold edge. The card stock's original color appears to have been cream (matte finish) for the front and back. There is no border line. The ink used to identify the photographer is green. (2) The photographer’s imprint on the front (recto) lists the photographer Ball & Rindahl Studio, Main Street, Grafton, N. Dak. (3) The back (verso) of the card is blank cream in color. (4) Background - a rather elaborately painted backdrop. Henry A. Ball and J. O. Rindahl. Ball was a partner in Ball & Rindahl, Grafton, North Dakota, in 1890; a partner in Ball, Dix & Mead, Ft. Randall, Dakota Territory. The association with Dix and Mead would have been prior to 1890 as the Dakota Territory was divided into the states of North Dakota and South Dakota on November 2, 1889. Ball and Rindahl had a fifteen year business association. 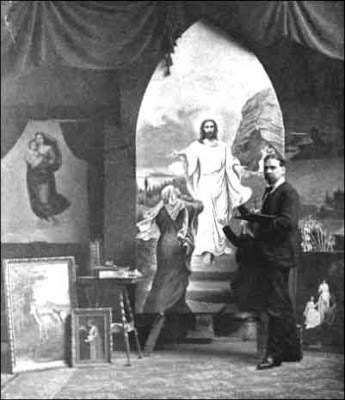 The elaborate backdrop may have been painted by Rindahl as he was a landscape painter (See below). The hairstyle of the bride is consistent with the styles worn during the beginning of the 1890s and the end of the previous period. A large section of hair at the top of her head is cut into a curly fringe. The rest of the hairstyle can not be seen in the photograph. The bride's gown is more consistent with the time period of 1883-1888. The sleeves are skin tight ending just short of the wrist with no cuff. The neckline appears to be a stiff moderately-high standing collar with a collar band underneath just barely visible. She wears a perfect fitting bodice, a skirt just above floor length with lace trim, a draped overskirt and small bustle. The veil is a filmy full body veil with what looks like the traditional orange blossom trim. I found a hat similar to that held by the young boy in the Fort Wayne Sentinel, July 02, 1890. All of this is consistent with the late 1880s early 1890. The cabinet card was most likely produced in the 1880s early 1890. With the child pictured in the wedding photograph it is a reasonable assumption that this is a second wedding for either the bride or the groom. The child is not positioned in the center of the photograph between the bride and the groom. Instead he stands to the right of the groom, leans on him, and has his hand on the groom's leg. The groom has his arm around the child. The child's attachment appears to be to the groom. Could the child be the son of the bride? It is highly doubtful. The bride is wearing a white gown. Were this her second marriage her wedding gown would most probably have been grey or lilac. The convention of the time was that a first time bride brought her virginity to the marriage as part of her dowry. That virginity was evidenced by the wearing of a white gown. The white gown may also be evidence of the family's financial position. Many brides during this time wore their Sunday best as a bridal gown. Purchasing a white wedding dress for a one time use was an expensive purchase. Most white wedding dresses were worn by brides whose family had money. It is also unusual that the bride is not wearing a wedding ring in the photograph. Was the photograph taken before the ceremony? The most unusual feature of the photograph is what the groom is holding in his left hand, the hand closest to his heart. At first I thought it might be an envelope or the wedding certificate. However, when I enlarged this portion of the photograph I could see the object appeared to be stiff and had rounded corners. The object looks very much like a cabinet card face down. Could the groom be holding a photograph of his deceased wife and the mother of his son? What Is The Groom Holding? The bride appears to be very young, quite a bit younger than the groom. 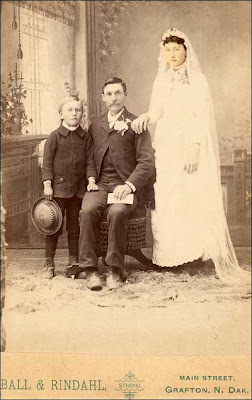 Perhaps an older bride would have objected to the cabinet card taking such a prominent place in her wedding photograph. A younger bride might not. 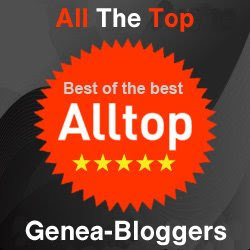 Note: Like coming upon an automobile accident after the dust settles and the cars stop moving, what really happened can be simple or a great surprise, and a look alone rarely determines what happened. The whys and wherefores of a photograph can be equally difficult and often as incorrect. There could be many other plausible explanations for the photograph. Henry A. Ball was born in Albany county, New York, December 9, 1845. He came to Minnesota in 1866 where it appears from the census he studied photography with his younger brother Jerome. In 1869 he settled in Delano where he established the first newspaper in the town, called the Big Woods Citizen, with Daniel Fish. In 1870 Henry is living with his first wife Carolyn in Glencoe, Minnesota in the home of William Russell a cheese maker and his wife Lavica. Sometime between 1870 and June of 1879, Henry's wife Carolyn dies. Henry then marries Jennie Webb in Delano, Minnesota, 9 June 1879. 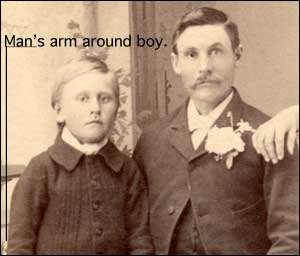 Henry and Jennie are found living in Melrose, Sterns County, Minnesota in a boarding house owned and operated by Peter Wilhelm. Henry's occupation is listed as a photographer, it was in Delano that Henry became a professional photographer. Henry and his wife Jenny arrive in the Dakota Territory in about 1883. Henry is a partner in Ball, Dix, and Mead in Ft. Randall, Dakota Territory, producing stereoviews probably for the Black Hills View Company of Deadwood, Dakota Territory. The Dakota Territory was divided into the states of North Dakota and South Dakota on November 2, 1889. Dakota Territory was the name of an organized territory of the United States that existed from 1861 to 1889. In 1883, Henry and Jennie are living in Grafton, North Dakota and operating a photography business. Henry becomes a partner in Ball and Rindahl in 1890, a partnership that lasted for fifteen years. In 1920 Henry Ball is a 75 year-old justice of the peace. Upon his death in North Dakota, Henry is the state's oldest last veteran of the civil war having served in Company D 7th New York heavy artillery and in the 113th NY Regiment. He was wounded at Coal Harbor. September 6, 1895 he was living in Grafton, North Dakota and working as a photographer, but was traveling in Berlin. His passport application states that he was 6 feet tall with grey eyes and light colored hair. J.O. Rindahl was born on a farm in Stevens, Wisconsin, 10 January 1861. His boyhood days were characterized with vivid dreams of the beautiful pictures he would paint, the marvelous statues he would carve, and the magnificent palaces he would build – dreams of a normal healthy boyhood, in which the soul of an artist was seeking expression. Being one of a family of twelve, and growing up in the midst of pioneer conditions, dreams had to give way to stern realities of life. In spite of obstacles he managed to get some instruction in drawing from different instructors, but it was not enough to realize his hopes on, so he finally drifted into the photography business, in which he met with no little success. In 1895, Rindahl went abroad. While there he visited some of the renowned Art Galleries, and saw some of the world’s greatest masterpieces in art. They brought back to him in full force the unrealized dreams of his boyhood. He returned to Grafton, and in the moments he could spare from his photography business, and with his talent of no mean order, permeated with the inspiration he had received from his studious travels, he began to shape his dreams on canvas. Mace, O. Henry. Collector's Guide To Early Photographs. Iola, Wisconsin: Krause, 1999. Collections By Minnesota Historical Society, Georgia Historical Society Published by The Society, 1912. Grafton Centennial, Grafton Carnegie Library, telephone conversation with librarian Sue Vot, 22 August 2008. 1870 U.S. census, McLeod, Minnesota, population schedule, Glencoe, p. 151, dwelling 29 , family 29, Henry A. Ball (Boarder); digital images. Heritage Quest (http://persi.heritagequestonline.com/ : retrieved 16 August 2008); citing NARA microfilm publication T132, roll 7. 1880 U.S. census, Stearns, Minnesota, population schedule, Melrose, p. 550, dwelling 42 , family 42, Henry A. Ball (Boarder); digital images. Heritage Quest (http://persi.heritagequestonline.com/ : retrieved 16 August 2008); citing NARA microfilm publication T9, roll 634. 1900 U.S. census, Walsh, North Dakota, population schedule, Grafton, p. 166, dwelling 376 , family 391, Henry A. Ball (Head); digital images. Heritage Quest (http://persi.heritagequestonline.com/ : retrieved 16 August 2008); citing NARA microfilm publication T623, roll 1233. 1910 U.S. census, Walsh, North Dakota, population schedule, Grafton, p. 199, dwelling 161 , family 164, J.O. Rindahl (Boarder); digital images. Heritage Quest (http://persi.heritagequestonline.com/ : retrieved 16 August 2008); citing NARA microfilm publication T624, roll 1145. 1920 U.S. census, Walsh, North Dakota, population schedule, Grafton, p. 111, dwelling 113 , family 120, Henry A. Ball (Head); digital images. Heritage Quest (http://persi.heritagequestonline.com/ : retrieved 16 August 2008); citing NARA microfilm publication T625, roll 1342. Ancestry.com. U.S. Passport Applications, 1795-1925 [database on-line]. Provo, UT, USA: The Generations Network, Inc., 2007. Original data: Passport Applications, 1795-1905; (National Archives Microfilm Publication M1372, 694 rolls); General Records of the Department of State, Record Group 59; National Archives, Washington, D.C.
Well I am more concerned about the bride's "man hands" - is it just me or am I seeing this correctly. Compare the size of "her" hands to those of her husband. I love your analysis of this photo. fM, is the bride wearing lace fingerless gloves? That might account for their seemingly large size. They do seem out of proportion to her figure. 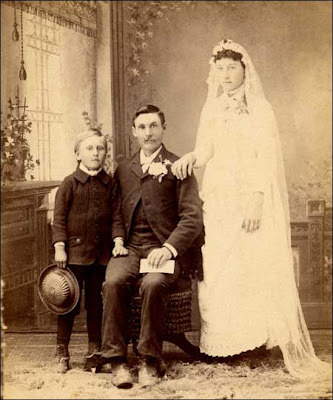 After reading your fine analysis ;-) my thoughts regarding the photo is that it is a father with his two children and the cabinet card could be that of his deceased wife. Though I don't know if the man looks old enough to be the father of the girl. But, as you state "There could be many other plausible explanations for the photograph." The young lady does have very large hands! As always, I feel that I have learned a great deal in the most wonderful way - thank you! Yes, I did notice her hands, sans wedding ring. Farm girl? Becky: I love your take on this. A real possibility. I agree that I'm not sure he's old enough to be her father, but stranger things have happened. I'm going back to look at confirmation clothing. What if this is confirmation rather than wedding? I was thinking this was a staged photo -- meaning they had to wait a few years before they could afford the fancy white dress. That was, until I got to the part about no wedding rings and that cabinet card. Gasp! Has to be the dearly departed mother. Then I realized if it was *their* son (born in the years since their earlier, less lavish wedding) he would be standing in between them. Not over with Dad and the photo. MAVEN, What an interesting "story" you've pulled us into! Several options of course to "explain" the photograph --- but I think you are on target --- son with father and new step-mother. I do hope your photograph is viewed by someone who can put names and dates and explain the "reason" for the picture. Another SHADES inspired mystery. . . The one thing I find a bit confusing is wouldn't the wedding picture have to have been taken after November 2, 1889 as the photo says Grafton, N. Dak (or was it reffered to as North Dakota prior to becoming a state)? So more likely early 1890's versus late 1880's? Thanks! The only thing we can say (and not for certain) is November 2, 1889 (as discussed) forward for the N.Dak indication, the other information consistent with the late 1880s to 1890. The photograph could have been taken prior to November 2, 1889 and printed after that date. We just don't know for certain. We don't know how long statehood was anticipated and if the photographers ordered cabinet cards in anticipation of that act using the cards before actual statehood. The possibilities are endless which is why you always hedge your bets. Dating photographs is always confusing. I'm going with this image being a family portrait commemorating the girl's first communion.